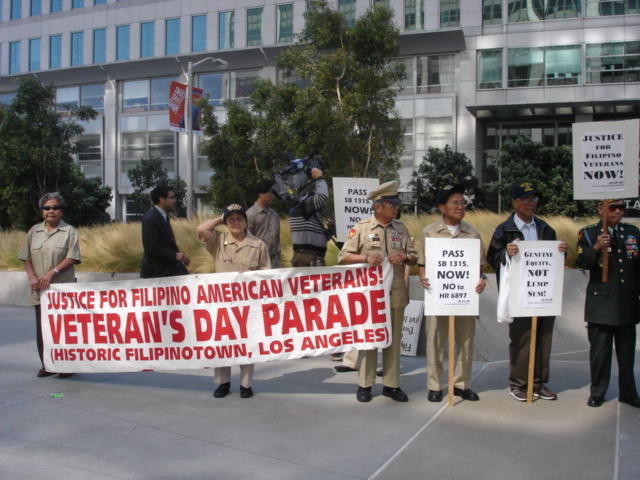 The Los Angeles City Council today unanimously approved the resolution in support of California AB 199 and AJR 6 in a legislative effort to recognize the presence and contribution of Filipino World War II veterans in our history books, To support Asssemblyperson Fiona Ma?s effort City Coouncil member Richard Alarcon introduced the resolution. It was seconded by Councilmen Tom Lebonge, Eric Garcetti, Jose Huizar,Ed Reyes and Bill Rosendhal, a Vietnam War veteran. All of them spoke to support the resolution to the delight of the crowd. To support Asssemblyperson Fiona Ma’s effort City Coouncil member Richard Alarcon introduced the resolution. It was seconded by Councilmen Tom Lebonge, Eric Garcetti, Jose Huizar,Ed Reyes and Bill Rosendhal, a Vietnam War veteran. All of them spoke to support the resolution to the delight of the crowd. Filipino World War II veterans John Aspiras of JFAV, Jack Vergara of SGS, Jovy Alejandrino, Vice President of SPACE, Dr. Jay Valencia of NUHW, Arturo P. Garcia, JFAV National Coordinator and youth leaders Ivy Dulay and Amurus Dumalaog of SIPA, spoke in behalf of the Filipino American community of Los Angeles. They all thanked the City Council for their gracious and wholehearted support for Filipino Veterans and widows for the 15 years of their struggle for justice and equity. AB 199 or the Filipinos I WWI Social Studies Act ensures that social studies instruction from grades 7-12 includes the significant role of Filipinos in World War II. While AJR 6 is a support resolution that encourages the US Congress to enact HR 210 or the Filipino Veterans Fairness Act of 2011 authored by Rep. Jackie Speier . For JFAV and the Filipino American community of Historic Filipinotown this resolution meant a lot for it serves to honor the living heroes of the Philippines and the Filipino American community in the United States. Most especially the remaining men and women who fought and experienced the Second World War in the Philippines. There are less than 40,000 living veterans and widows both in the US and the Philippines. Historic Filipinotown and San Francisco is the highest concentration of Filipino World War II veterans to the present.